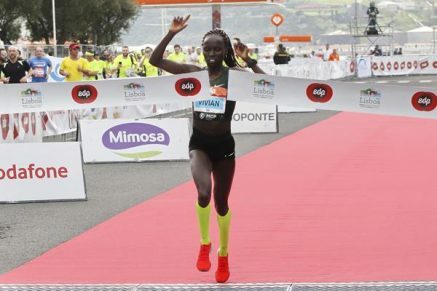 17th March 2019 – Despite having won virtually everything there is to win, Vivian Cheruiyot (KEN) is still finding ways of setting new records and new personal bests. At the Lisbon Half Marathon Vivian picked apart a high-quality field with a display of powerful and dominant front running. In the pre-race press conference Vivian told the gathered media that she was looking to set her personal best and she more than delivered on her word. Getting quicker and quicker as the race went on Vivian came home for victory in 66:34, more than one minute ahead of second place and also taking more than one minute off her previous personal best. This performance highlights the good shape she is in as she prepares to defend her London Marathon title next month. Linet Masai (KEN) will be making her London Marathon debut at the same time and she also showed she is rounding into shape with a fourth place finish in 68:50. In the UK, both Chris Thompson (GBR) and Stephanie Twell (GBR) ran their second half marathons in 8 days and both took decisive victories. At the Bath event Chris clocked 63:10 for the win and at Reading Steph timed 71:37. On what was a very successful weekend for PACE athletes Jordan Hasay (USA) rounded off proceedings with victory at the Shamrock 15k in Portland. Using the race as a competitive training session, Jordan timed 51:32 before heading off to complete a post-race workout.